Some time around six months, your baby’s going to be sitting up and starting solids. We think we have found the perfect three-stage seat that actually grows with your baby. We get it, meal times can be pretty messy with babies! That’s why it’s so important to get a good, practical seat that can actually make meal times fun, rather than stressful. The super cute Baby Bud is pretty much the design we’ve all been waiting for. You can easily attach it to any chair, and the four adjustable feet and extra-safe harness keep it safe and secure. There’s also a soft, comfortable seat insert that can be removed as your child grows, meaning the chair will adapt to hold your child from six months old, right up until age three. High chairs often take up a lot of room and can require a lot of cleaning. Not fun when you’re dealing with three messy meals a day. Here’s where the Baby Bud really stands out: it’s actually designed to sit perfectly on any chair, and slips discreetly underneath the table. It also has a smooth, wipeable surface, so cleaning it down after meals is quick and easy. The Baby Bud comes in four delicious colours – red, teal, pink and putty. So even though you can tuck it away, you can also proudly display the compact design in your kitchen or dining room. As your toddler starts moving around, so will you, and the Baby Bud is perfect for meals-on-the-go. No need to fold up clumsy high chairs, just detach your Baby Bud, and use the additional handles to take it to cafes, restaurants and friends’ houses. 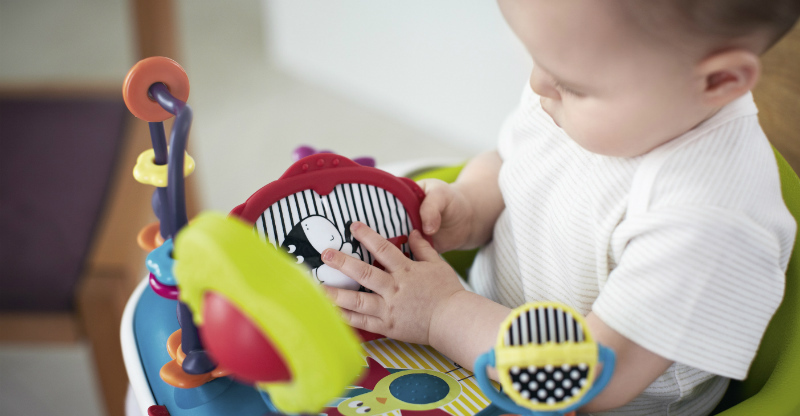 If your little guy likes to play while they eat, you can also add the activity tray, which has nine interactive features and 24 different toy arrangements to grow with your baby. Great for keeping them entertained when you’re out and about. It’s official: breakfast, lunch and dinner are now sorted! The Baby Bud is available at KidsLifestyle and or any of these stockists. Prices begin at $109.95.